… Julia Child, Late American Chef, Author, and TV Personality. Non-veg cookery involves preparing food using eggs, meat, pork, and seafood. There is a very wide variety of non-vegetarian cookery around the world. In some parts of the world, the meat of wild animals is barbequed (often called Brai in Africa) and consumed. A large number of snacks, breakfast items, and main course non-veg dishes can be cooked using various meats. Let us learn about different types of non-veg items. Eggs are staple non-veg food. They are used in baking and preparing desserts like mousse. There are many varieties of labelled eggs in the market. Let us understand what those labels mean. The hens are fed with omega-3 fatty acid sources, such as flax seed. The hens are enclosed in cages, and are kept away from accessing litter, perches or nests. This means the hens can access their nests or perch within their cage. Cage-free hens are not confined to a cage, however, that does not mean they have access to the outdoors. Free-run hens can wander around a confined open space, perch, access their nests, but may not access outdoors or natural light. Under good weather conditions, the free-range hens are permitted to wander in open-range barns, and access their nests, perches, litter, outdoors, and natural light. The hens are fed with 100% organic feed. They are always provided with clean, fresh water. These eggs are most costly. The hens with white feathers and white ear lobes lay white eggs. The ones with brown feathers and red ear lobes lay brown eggs. There is zero nutritional difference between the two eggs. Eggs are sized according to their weight. There are various sizes of eggs such as: between 53 - 63gm are Medium, between 63 - 73gm are Large, and the ones weighing more than 73g are Extra Large. Meat comes from cattle and poultry. They are raised at farms with proper feeding and care. The meat from cattle is more commonly known as red meat. There are various types of meats. Beef − It comes from cattle over 12 months old. This meat is dark red in color with a thick layer of white fat. The meat is hard and thick. Veal − It is the meat of cattle less than 3 months old. It is deep pink with medium layer of white fat. Veal is lean and tender as compared to beef. Pork − It is the meat of domestic swine (pig). The meat is light pink in color with a thick layer of creamy-white colored fat. Ham − It is the meat of pork leg. Bacon − It is the tender meat of pig’s belly. Pork ribs − It is the meat around pig’s ribs. Lamb − It is the tender meat of sheep or goat aged less than one year. It is light red and soft as compared to mutton. Mutton − It is the meat of sheep or goat older than one year. It is maroon-red colored meat, harder than lamb meat and gives strong flavor. Game Meat (Venison) − It is the meat of any animal that is hunted for food instead of raised in the farms. It includes the meat of Rabbit, Pheasant, Wild duck, deer, or sometimes a bigger animal like bison. It has strong flavor. The game meat is widely consumed in Africa. Meats take longest time to cook in non-veg cookery. 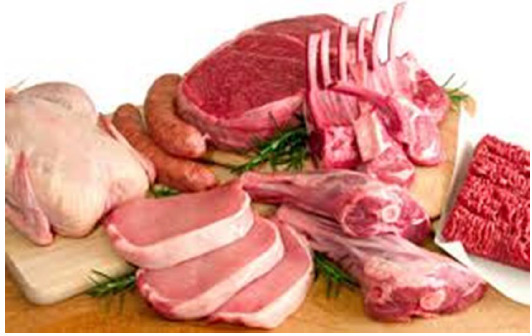 Shelf life of meat is 3 to 4 days in refrigerator or a couple of months in freezer. It is the meat of domestic fowls such as chicken, duck, goose, or turkey. Good poultry meat comes from well-fed hygienic hens. The poultry must be with well distributed fat and blemish free skin. The dressed poultry is slaughtered, de-feathered, and ready to roast whole bird without head and clamps. Poultry gets cooked faster than red meats but quicker than fish and shell fish. The sausages are cured and uncooked meat rolls. Sausages are prepared by blending any ground or minced meat with breadcrumbs, starch or flour, and spices, and filling the mixture into casings of various diameter and lengths. At the time of consumption it is cut into slices, often called salamis. Fish − They are fish with fins and internal skeleton. For example, Tuna, Mackerel, and King fish. Shell Fish − They are fish with shell but no internal bone structure. For example, Crabs. Let us understand more about Fish. Dressed − Fins, tail, scales, and head removed. Steak − Cut into cross section slices, each slice containing a part of bone. 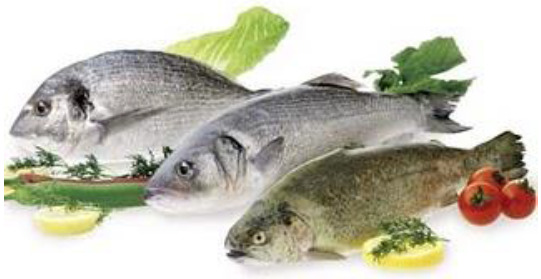 Fillets − Boneless sides of fish; with or without skin. Tranches − Pieces of fillets. Butterfly Fillet − Both sides fillets kept naturally joint while cutting. Bivalves − They have a pair of hinged shells. For example, Clams, Scallops, and Oysters. Univalves − They have a single shell. For example, Abalone and Conch. Cephalopods − They have prominent head and tentacles. For example, Octopus and Squid. 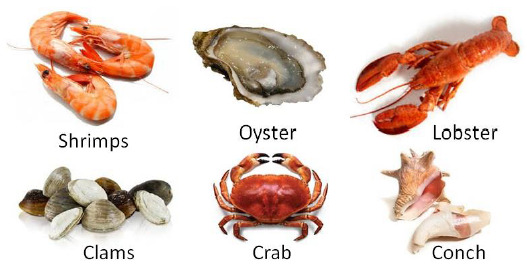 Crustaceans − They have segmented shells and joint legs. For example, Lobster, Shrimp, and Crab. If the tail of Lobster snaps back after pressing, it is fresh. If shrimps are odorless, shells attached firmly, and with bulging eyes, then they are fresh. If the clams and oysters are firmly closed, they are fresh. Fish and shellfish are stored either cooked or raw in freezer, or just raw in crushed ice. Fish should be cleaned and scaled properly before cooking. Intestinal track of shrimps need removal. Being tender, fish and shellfish need cooking at moderate temperatures. Small pieces of fish can be cooked directly from freezer. Cooked fish need careful handling to avoid them falling apart. Meat or Fish Stock is a flavored liquid obtained by boiling meat or fish in water. It is the basis of non-vegetarian soups and sauces. For stock preparation, the chef simmers portions of Veal, Beef, Chicken bones, or Fish bones. The simmering is carried out for longer time than vegetable stock. Bone simmering takes even longer than meat simmering. To shorten the simmering time of bones, they are pressure-cooked. The spices or herbs and salt are added to enhance the flavor. The stock is boiled for 30 to 40 minutes and removed from heat. Once it reaches room temperature, the stock is stored in a container. It lasts fresh for 3 to 4 days if stored in the refrigerator. By boiling it again, its shelf life can be extended. Soups is a type of liquid food prepared using meat or fish stock as per the choice. There are two types of soups. It is the soup with thin consistency and transparent appearance without pieces of meat or noodles. It is made of meat stock. There is no thickening agent added either. This soup has high proteins and can quench hunger largely. It is thickened by use of roux, rice flour, or starch. The thickening agents blend well with other foods. Different thickening agents provide different consistency. The cartilage and connective tissue in the bones thicken the liquid and bring flavor to the stock. As the meat also provides some amount of fat, the meat soups appear oily too. Chicken Soup − Juliennes of cooked chicken + chicken stock + vegetables. Callaloo − Thai soup made of cooked crab meat and okra. Clam Chowder − Cooked and scooped clams + potatoes and onions + bacon. Egg Drop − Chinese soup made of beaten eggs + chicken broth + black pepper powder + spring onion. Erwtensoep − A traditional soup from Netherlands, served with sliced sausages. Goulash − Hungarian soup made of beef + onions + red peppers + paprika powder. Lobster Bisque − French soup made from Lobster stock. Sauce is a liquid, semi-liquid, or creamy food cooked by blending multiple other foods with ground meat. They enhance the taste and moisture in the main food. Meat sauces coat pastas or steaks. Their vibrant colors also increase aesthetic appeal of the food. Non-veg salad is made by combining shreds or stripes of cooked chicken, pieces of sausages, or small cubes of cooked mutton, beef, or pork. Egg salad is made up of boiled eggs or scrambled eggs chunks. Fish salads are made of cooked fish stripes in pair with various salad dressings. The pieces of non-veg are often paired with salad vegetables such as tomatoes, celery, lettuce, onions, and cilantro, and some flavorful salad dressings. Pairing chopped salamis or sausages is a great way of preparing non-veg salad. For example, Tuna Salad, Scallops Salad, Chicken Salad.